Ah, summer. The perfect time to lay on the beach, kick off your shoes, grab a trashy romance novel, and just treat yo’ self. Or, barring that, it’s also the perfect time to close the curtains, stock up on Totino’s Party Pizzas, and watch Breaking Bad over again from the beginning. “Come on out and make lasting memories with us,” your friends will say, almost as if they don’t realize just how great Breaking Bad is. But you know. You were there when the bathtub fell through the ceiling, and when Gus’ face got blown up, and when Jesse said that thing about magnets, and when Walt built that robot. You don’t need beer with lime in it or whatever else people do in the summer. You need to watch Breaking Bad. Luckily, AMC will be replaying the whole series next month in weekly binge-friendly marathons. As reported by Entertainment Weekly, the fun will start on August 10, with several back-to-back episodes airing until the morning. Then AMC will do the same thing every Sunday until it shows the series finale on October 5. 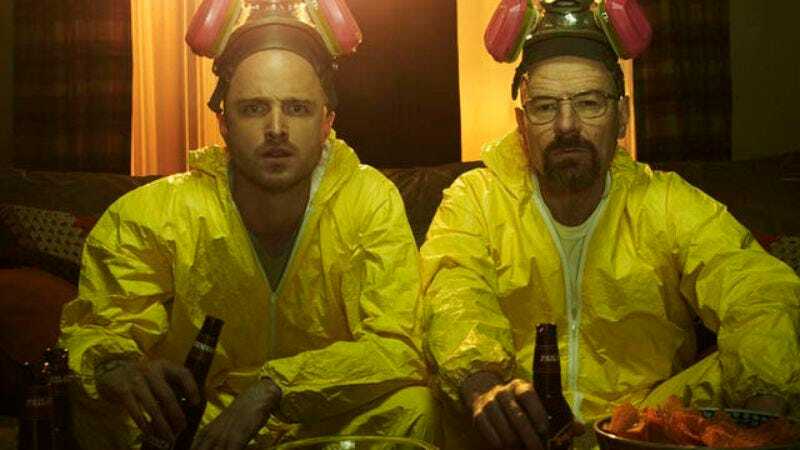 In between episodes, AMC will reportedly show “never-before-aired interviews with both the cast and crew, as well as behind-the-scenes footage and commentary.” It will be like Bryan Cranston and Vince Gilligan are right there talking to you, long after your real-life friends are gone. This is all ostensibly to get people hyped for Better Call Saul, but with that show’s premiere having been pushed back to 2015, the real die-hard Breaking Bad fans will probably want to squeeze another marathon or two in just in case. Of course, this would also be a great opportunity for anyone who hasn’t seen Breaking Bad to finally catch it, but they should probably ignore everything we said at the end of the first paragraph.